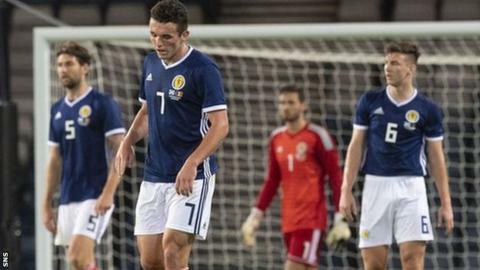 Scotland's players "should not be downhearted" despite their 4-0 humbling by Belgium, says manager Alex McLeish. An error-strewn performance consigned McLeish to a fourth defeat in five games, with just one goal scored. John McGinn and Ryan Jack were caught in possession for two of Belgium's goals, and Charlie Mulgrew conceded possession in the run-up to another. McLeish said "if anybody's got to take the blame it's me for telling them to pass it". He added: "I don't want them just to lump it up the pitch. If we do that, when are we ever going to change?" His players will be "buzzing again" in time to face Albania in the Nations League opener. Romelu Lukaku scored in the first half, then Eden Hazard and Michy Batshuayi (2) added three further efforts after the break as the Belgians ruthlessly punished Scotland's mistakes. It means they have now conceded eight goals and scored just once in McLeish's five games in charge in his second spell as Scotland manager. "The guys have to learn fast," he said. "They're young, they've just broken into the team over the last year or so, and they were playing against some world superstars, who have been together for a long time. "Belgium never really cut us open. The goals that they got were big gifts. Take those away and it's looking a much brighter result. And we had some moments, we cut through Belgium a couple of times. "We know we're not at the Belgium level. We know we're not absolute silky passers but there is a lot of ability in there, players who are playing at a very good level." Scotland now welcome Albania at Hampden on Monday, with the Balkans side top of the Nations League group after beating Israel 1-0. Celtic striker Leigh Griffiths went off at half-time with a calf problem but McLeish was unsure of the severity of the injury. He did however, add that Hearts defender John Souttar "didn't do himself any harm" on his debut. "The next game's massive for us," McLeish said. "That is the most important game. We're down but we're certainly not out and we will be buzzing tomorrow again." Alex McLeish has a new project and you have to be patient. You can see they are a dynamic, energetic young group with strong technical ability. There are positive signs. It was very difficult for us in the first half to break the system down and they counter-attacked with quality. Is there anyone in that team that you think deserves not to be there? And look at the bench. James Forrest has been excellent for two years, Jonny Russell is playing well, Ryan Jack has had a fantastic start to the season. Graeme Shinnie is reliable. He is more than capable of being in that squad. The bottom line is we won't play Belgium on Monday night. We have a good, young, energetic group of players.